Returning client from many years ago Dan brought along his son Sam for a day’s fishing trip on August the 18th. Dan told me that it had been a very long time since Sam had been fishing, so I was praying for a good day. I gave some instructions on the hows and how toos. I set out four rods at various depths and we began our day. It wasn’t even five minutes when the port side rod was hit and Sam was reeling in his first fish of the day. That fish turned out to be the smallest fish of the day, (a two pounder) After resetting the rod and a while later another rod was hit really hard and Sam began reeling on the fish, as I was slowing the boat I could tell this was a great fish as it appeared behind the boat and after making some great runs I was able to slide the net under the big fish and drag the net back to the side of the boat. I handed the fish to Sam for a few photos and then I weighed it, it weighed five pounds five ounces!! WOW!!! I rest the rod and we continued on. When Dan said lets get one bigger I knew it would be tough to do, but not impossible. After boating yet more massive trout over four pounds, I happened to be watching one of the rods and I could tell that it was getting hit and then it came off the clip and Sam was reeling on another great fish as it was taking lots of line and when it came to the boat, it was hard to believe, but I thought Dan was right, SIX POUNDS, yes a six pound rainbow trout from the waters of New Melones. Then how could this get any better? 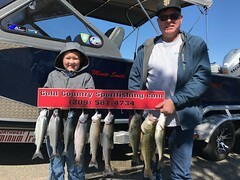 We had a double hook up and both father and son were each reeling in a great fish. 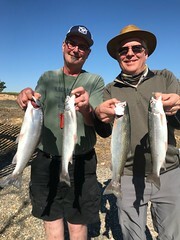 This day was an incredible day with a record day for big fish. I weighed each fish as they came onboard and the total weight for all ten fish was 38.24 pounds. Each weight was a 5.5, 4.14, 4.2, 2.0, 6.0, 3.2, 3.10, 3.5, 3.3, 3.3. A great day with two great people. Thanks again guys!!!!!!!!!!!!!!!!!!! 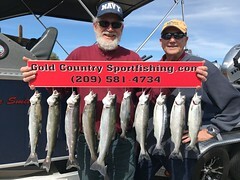 This entry was posted in California, Gold Country, Gold Country Sport Fishing, Melones, New Melones, Rainbows, Trout. Bookmark the permalink.